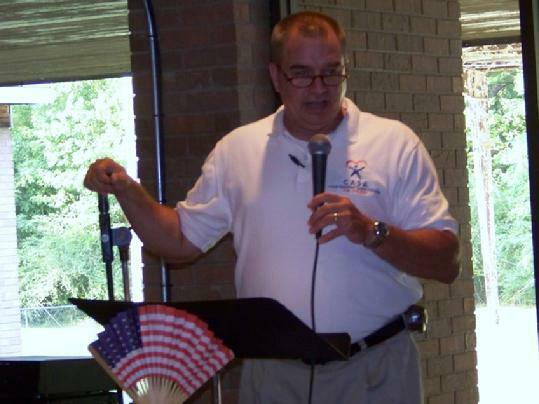 Casa of the Pines Director Jay Perry talks about CASA's need for volunteers. "Justice is Served": CASA Fundraiser Held at Central Baptist Church, LIVINGSTON, July 31, 2008 - Court Appointed Special Advocates (for children). The mission of CASA is to educate the community regarding its responsibility for abused and neglected children, and to advocate for those children through the state foster care system and the district and the family courts of the State of Texas. Sheriff Ken Hammack, District Attorney Lee Hon, Onalaska Mayor Lew Vail, Livingston Mayor Clarke Evans and many other community leaders and concerned citizens came to the Central Baptist Family Center to enjoy fried fish and to raise funds for CASA. Two auctions ran simultaneously; a silent auction, and a regular auction hosted by Mayor Evans. Polk County folks dined on fried catfish, coleslaw, baked potatoes and brownies while being served by D.A. Lee Hon, Chief Deputy Byron Lyons, and Sheriff Ken Hammack just to name a few. When a child enters the foster care system because his or her home is no longer safe, a judge appoints a committed volunteer from CASA of the Pines to help them. CASA volunteers undergo a thorough training and development program that consists of at least 30 hours of pre-service training, followed by 12 hours of yearly in-service training. Tommorrow, PolkCountyToday.com will do an update story on the fundraiser and how much was raised to support this worthy and needed program. Interview with Casa of the Pines Director, Jay Perry.